I became a parent over 40 years ago. It taught me so many things and changed me in multitudes of ways. Each of my boys is a different as day and night, but both taught me similar lessons. Here are things I learned about money when I became a parent. Money doesn’t matter, family does. Every parent, rich or poor, experiences the joys, the sorrows, the highs and the lows of birthing their child, raising it and sending it out into the world. You are part of a family. There is someone for you to teach, mentor and with whom to share the world and your times. You fully realize that you are but a single link in the generations that have gone before and those that will come after – when you see your nose on your child and your Father’s dimple on his chin. Children are expensive! The latest figures from the US Department of Agriculture state that the average cost of raising a child in the USA from birth to age 18 is almost a quarter million dollars ($245,000). Gone are the days of rural America when having more children meant more help on the farm and more prosperity. Having a large family today is for the wealthy! Most children only take from the family finances, instead of contributing to them. Back to school time can cost more than Holiday time. As a poor couple just starting out, with lots of relatives expecting Christmas gifts, we often dreaded the holidays. We saved all year in order to be able to buy those gifts. But when the boys started school, we found out that it was even more expensive for us than holiday time. There were usually 4 new pair of shoes (2 per boy), 10 new pairs of jeans, 10 new shirts, sweaters, coats, boots, hats, gloves, and school supplies, not to mention underwear and socks and haircuts. I remember being very surprised the first time back to school expenses exceed the prior years Christmas spending. Kids rapidly learn how to separate you from your money. We held a pretty firm line at the store on the ‘I want this”, or “Can we buy that” but the boys still found our soft spots and used them to their advantage (not that we usually minded). Who says people aren’t born negotiators? I think most of us learn how by age 1.5 and then somehow forget after we get to be adults. Most parents don’t think they have time to teach personal finance. As with us, most of them are too busy juggling jobs, school, kids, parents and all of the mundane everyday tasks that go along with those. We get past teaching about potty training, move on to manners and into school work and church. Who has time to teach a kid about money market funds? 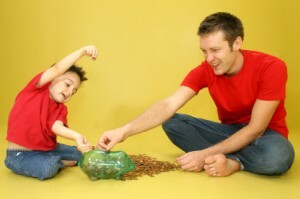 Let the kids pick it up the way we did, by watching and listening how their parents handle money! I didn’t specifically think about how to teach my sons to manage money. The expert books I read didn’t stress the need to do so. My parents hadn’t (that I remembered) made a big fuss about formal personal finance lessons. This is one area of parenting that I now wish I had taken a more active role in teaching (although both of my sons seem to do fine in this area so far). Children will usually mirror their parents financial attitudes. If you walk the walk, even if you don’t talk the talk, your kids will most likely copy the ways you manage your money. If you are a saver, they are likely to pick up on that and become savers themselves. If you carry a balance on your credit card and constantly complain about it, don’t be surprised if your kids do the same. Of course, some folks do take a hard look at the way they were raised and decide to do things differently. Its a good idea to let your child want something. If your child never experiences the strong desire to acquire or do something, he or she may never develop the idea of earning money to get it or of finding ways to accomplish it. As the author of “Young Bucks How to Raise a Future Millionaire” (Troy Dun) puts it: “Give your child the gift of want”. Most of humanity’s leaps forward have been the result of someone wanting something. Someone wanted the ability to keep warm and cook meat – and figured out how to tame fire. Don’t supply every little desire your child expresses. Instead, help them figure out ways they can go get that desire. What money lessons did you learn when you had children? I completely agree, parents set the examaple for how their children behave financially. My parents were always very money-conscious and tried their best to teach me the value of money and what it’s like to work for it and I’m sure that’s why I look at money the way I do now. I think that reckless spending is usually hereditary. I’ve also never understood when parents pay their kids to do chores around the house, it’s a family after all, you’re SUPPOSED to help each other! Ah the great debate – allowances and chores. I never realized it was an issue until my grandkids came along because my parents and my spouse and I always did allowances. When I was working full time, I wanted to hire a house cleaner, but my spouse didn’t want strangers in the home to do the job. My sons were teenagers at the time, so I hired them to do the weekly cleaning that I would have paid someone else to do. Sure, I could have asked them to do it for free, but they had other contributions they made to the family to help it out. I suppose it really depends on how it’s done. I’ve seen a lot of cases where kids don’t move a muscle for their parents unless money is involved, which I see as moving away from the family spirit. It’s disheartening to say the least. But it really depends on how that work-money relationship is seen in the household. I think it’s a great idea to teach kids about finances and money from an early age. Like you said, kids mirror their parents and seems like giving them the tools to understand personal finance would be very important. I hope to be able to give my kids a firm grounding in financial reality! Parents have so much to teach. Sometimes personal finance takes a back seat to other (really more important) things, like personal care, learning to read, driving a car, being part of humanity and one of God’s children. But I do also feel it is important enough for parents to set aside specific time to teach it. I hope to teach my children (if we eventually have any!) that saving money isn’t just to hoard or to fulfill selfish wants. Of course, I’m still learning this lesson myself, so I better learn fast before kids come along! Set the example, it will be the most powerful way for your future offspring to learn your values, supplement the example and point it out specifically too and that might reinforce it. One of the most important things we should learn as children is how to manage money and have it work for us. I wish it was responsibly taught in school from kindergarten through 12th grade. We’d all be in a lot better fiscal shape if more practical subjects were taught in school. Not all parents are able to teach their children how to deal with money issues, since they don’t always have a clue themselves. I think the public schools are at last moving in the direction of including personal finance subjects – slowly. Being a parent teaches you to put the importance of money in perspective. When my daughter fell and split her forehead open on the bed, the only thought in my mind was getting her taken care of. Only after she was stitched up did the thought of what it would cost enter my head. Well sure, that would be the case with most every parent I hope! How is she? As a new dad it’s really cool to read this post. My wife and I definitely plan to teach our son about personal finances and get him involves as much as possible. Interesting idea on letting your kid wanting something. Good point. Sometimes it is hard to let your child want something – especially if you have the means to easily supply what that thing is, but children need to know that there every want will not always be supplied and to learn how to go about taking care of those wants themselves.